Okay, I admit it: I’m a little extra. Not all the time, but there are some things for which I just can’t resist going a little over the top. And faux fur is one of those things! When JOANN let me know they were sending me some of their new faux fur for this month’s partnership, I could imagine so many gorgeous, cozy possibilities. 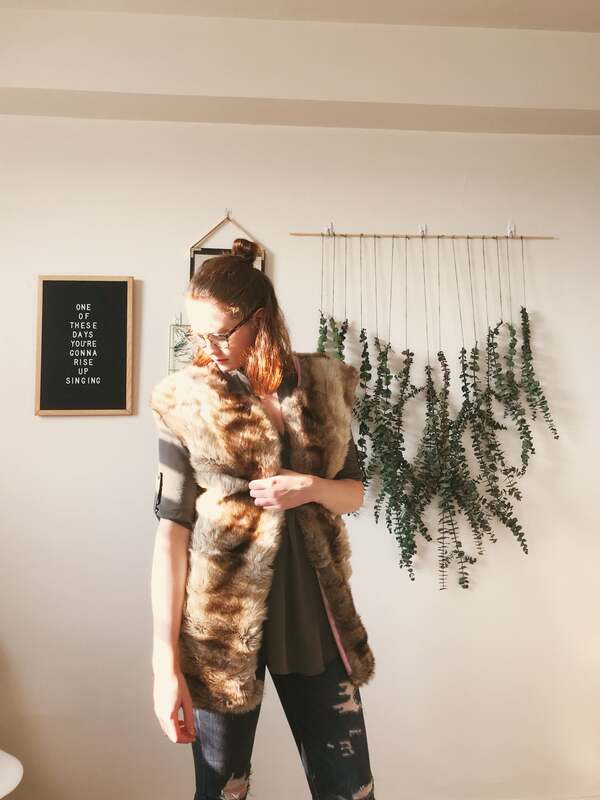 Today I’m sharing my DIY faux fur vest with you, and showing you how to make one of your own. No pattern required, and it’s so easy that you could crank one out in an hour or two! My vest is made using some AMAZING faux fur from JOANN. It might seem like an investment, but I was able to make mine with about a yard of fabric and a yard of lining. For no more than $35 of materials, I was able to make myself something that’d probably cost double that at a store! I made my vest without a pattern. To do the same, you need a tee shirt whose slightly oversized fit you like. If that’s not your thing, I have a few pattern recommendations, of course. Simplicity 8219 is basically what I’ve made if you want to replicate it with a pattern. You’d look like you just stepped off the runway in Burda 6359! Or, maximize your coziness with McCalls 7511, which has a shawl collar and a hood. I started by cutting out my lining pieces. It’s hard to pin faux fur, so doing the lining first let me use them as slightly more substantial pattern pieces. If you’re not lining your vest, trace the pattern pieces onto the knit backing of your faux fur. Chalk works well for this, or a water soluble fabric pen. Normally I’m all about the Pilot Frixion pen, but I wouldn’t iron faux fur. To decide the shape and size of your vest front and back, you need that tee shirt. Tuck the sleeves into the arm, and fold it in half. For the back, put the tee shirt on the fold. Trace around the tee shirt half, adding in whatever seam allowance you prefer. I recommend making the shoulders a little narrower than your tee shirt. Those gray spots on my carpet are faux fur debris, not like gross carpet nastiness! To prepare cutting the faux fur, lay it down on your cutting surface in a single layer. This fabric has a nap, or a certain direction the fur lays best. Basically, make sure that the fur is running down the length of the garment. You’ll need to cut with the knit backing up. When it’s set up, lay the lining pieces down on the fabric. Weight them down if you need to so they don’t shift! Then cut out the faux fur, trying to only snip the knit backing and not the fur. I recommend cutting the faux fur pieces just a little larger than your lining so that the lining is rolled to the back. You don’t want to topstitch fur! Definitely have a lint roller and vacuum on hand. No matter how hard you try to only cut the knit backing, you’re going to end up with faux fur all over yourself. I lint rolled the cut edges of my vest pieces, too. Okay, I know I said this earlier, but this vest is really so easy. I love making lined things because it’s like magic watching it all get pulled together. With just a few flips and, like, the tiniest amount of hand-sewing, you’ll have a fully lined faux fur vest in no time. Start by sewing the shoulders of the lining together, and the shoulders of the faux fur together. Lay them out right sides together. Sew the center fronts and neckline together, and the armscyes (armholes) together. Then reach in and pull the vest right sides out through the tunnel created by one of the center fronts. This part is a little weird to envision, but trust me: it works. The vest is now right side out. With wrong sides together, match the left faux fur front to the left faux fur back and the left lining front to the left lining back. You’ll be able to sew the entire left side (faux fur AND lining) together in one long seam. Then repeat for the right side. It’s not important which side you start with, really, I just picked one to use specific language. Isn’t this coming together fast? I told you it would! All we have left to do is the bottom hem of the vest. Flip that vest inside out once again, so the right sides of the faux fur and the lining are together. Pin and sew the bottom hem together, leaving a hole for turning. I actually left the bottom of one of the front pieces open. Faux fur can be pretty bulky, so err on the side of too large. Pull the vest through the hole, and hand stitch it closed. Boom! You’re done! And probably covered in faux fur, but hey, I told you to have that lint roller on hand. Clean yourself up and you’re ready to hit the town in your amazing new faux fur vest.